This study examines the early years of the post-medieval European states and the growth of a recognisably 'modern' system for handling their international relations. 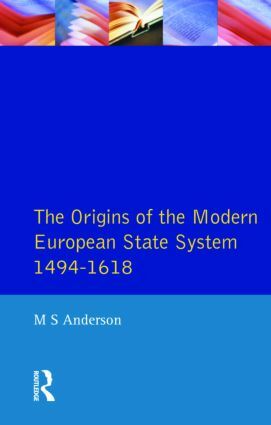 M S Anderson gives much of his space to France, Spain and England and to the state of the relations between them, as their various power plays rolled over Italy and the Low countries, but, he also incorporates the Northern and Eastern states including Russia, Poland and the Baltic world into the main European political arena. He provides a broad narrative of European politics and its impact on diplomacy including the Italian Wars 1494-1559, the French Wars of Religion, the Reformation and Counter-Reformation, and the relations of Christendom and Islam with the advance of the Ottoman empire. He also gives considerable attention to the influence of military and economic factors on international relations. 1. The Instruments of International Relations: Armies and Navies. 2. The Instruments of International Relations: Trade and Finance. 3. The Instruments of International Relations: Diplomats and Diplomacy. 4. The Birth of Valois-Habsburg Rivalry, 1494-1529. 5. The Empire of Charles V and its Enemies 1529-1559. 6. Spanish Power and Resistance to it 1559-1585. 7. Spanish Power Checked but Unbroken, 1585-1609. 8. Approach to Conflict, 1609-1618. 9. The Ottomans and Europe. 10. Eastern and Northern Europe: The Russian Advance. Chronology.